Cadgile is very pleased to announce at the EURONAVAL exhibition in Paris, that we have been acquired by leading French engineering services company Groupe FIVA. Together, we will develop further state-of-the-art engineering services across the defence, resources, energy and environment sectors in Australia. Existing Cadgile customers will see ‘business as usual’, including retention of all the Cadgile staff and our name. However, additional knowledge, experience and investment – including recruitment – will enable higher level engineering and project management work. Cadgile will remain at the forefront of CAD service provision as the Australian market continues to evolve. FIVA has extensive experience in global projects, especially naval and defence applications, with a workforce of more than 250 engineers and technicians in France, Spain and Australia. In combination with the close personal support offered by Cadgile, all Australian customers can expect continued and renewed commitment to delivering the highest levels of service. 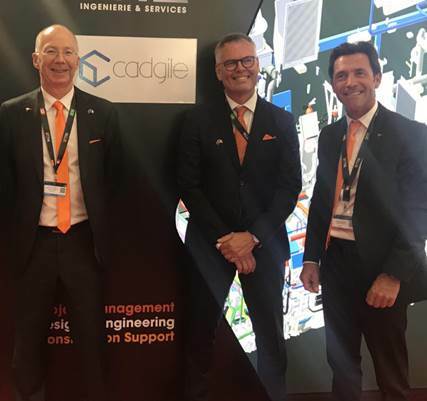 “We’re delighted with the Cadgile acquisition which will allow us to respond to the growing Australian market and its requests for engineering and related services. With this acquisition, we have joined with an award winning, multi-disciplined engineering provider whose clients include some of the largest companies in South Australia,” said Yannick Vergez, CEO of Groupe FIVA.